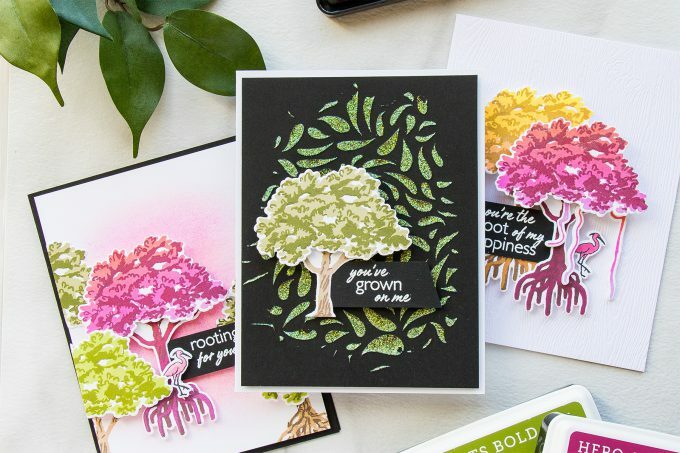 Welcome back to the 5th episode of the Color Layering with Yana video series! 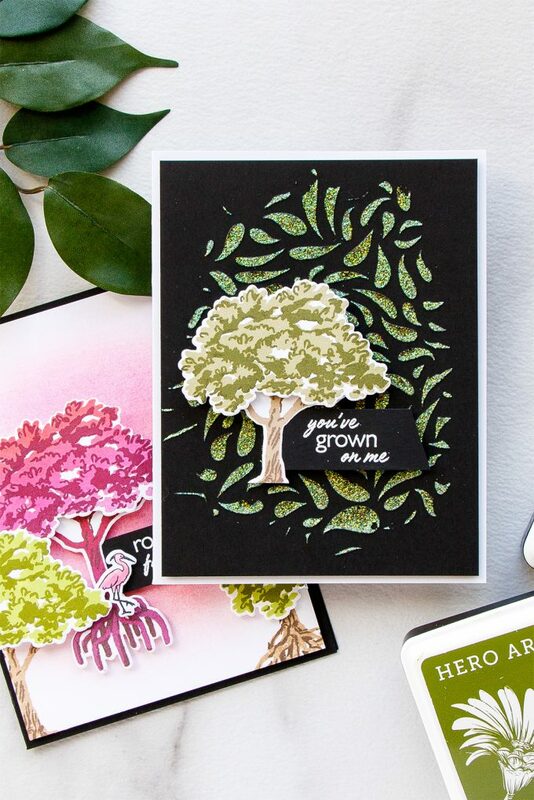 In each one of my monthly videos I explore different ink pad (and sometimes embossing powder) color options for Hero Arts Color Layering sets and will hopefully inspire you to stamp! These videos are published on Hero’s blog and Youtube channel on Mondays following the My Monthly Hero Blog Hops and I’m sharing them on my blog as well. 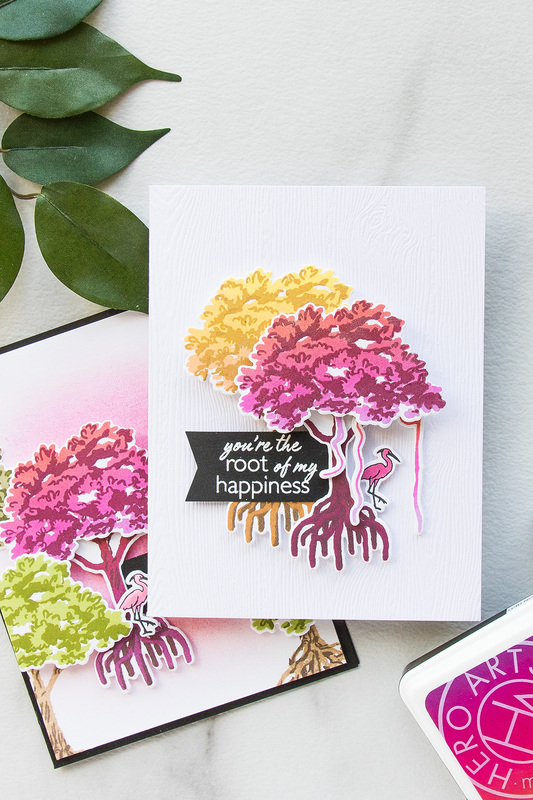 In this video I am taking a closer look at one of my personal favorite sets – the Color Layering Mangrove. 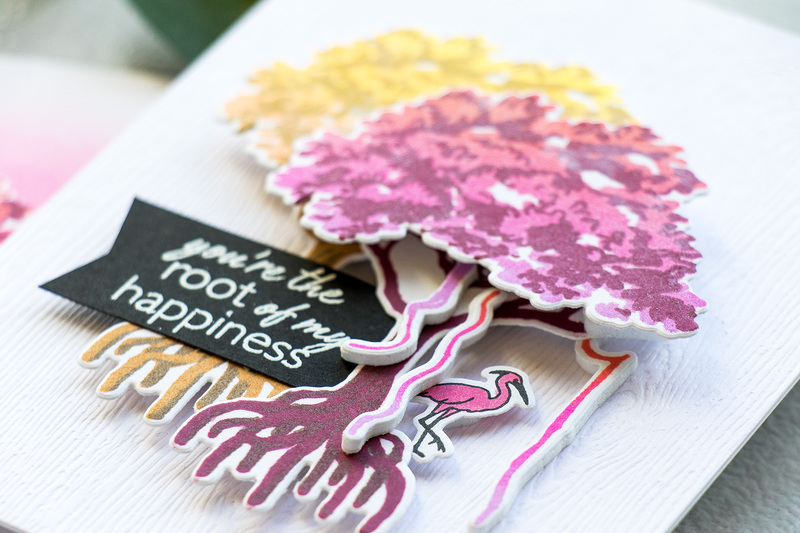 This stamp set has so much potential and with a bit of alteration can be used for a number of ways, not just for mangrove trees. 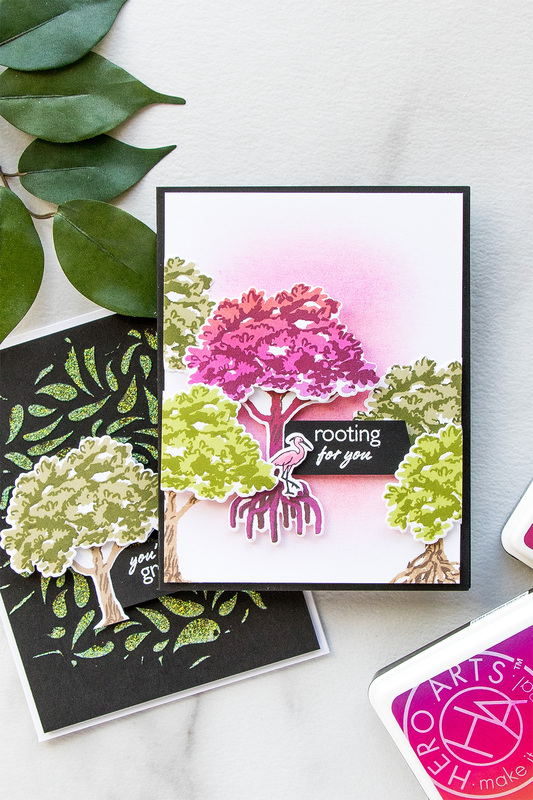 You might have already seen me use my leftover mangroves for my neighbourhood cards here. Watch my video tutorial below or on Youtube to learn how I made the cards I’m sharing today and see me explore various color combinations for this stamp set. This stamp set has a set of coordinating dies that cut almost every image included in the set out. I used my dies and cut my stamped images out out. I set them aside and started working on the backgrounds for my cards. I feel like the backgrounds as just as important as the foregrounds of a project. I used Neon Ombre Red to Purple ink pad along with a Dual Tip Blender Brush and blended a quick and easy ombre sunset like background. Since I was blending with an ombre pad I got that instant color transition and that I think, made it even easier to blend and have a beautiful and easy background in the end. 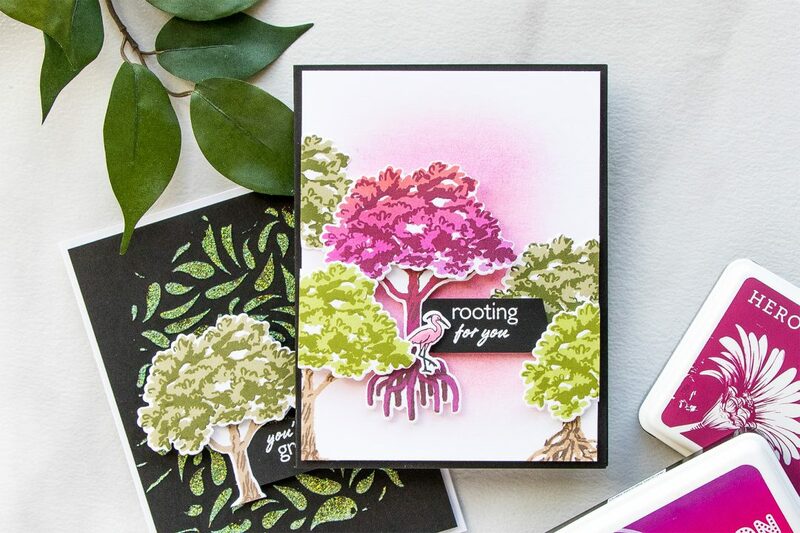 I used the red tree along with the red tree trunk and two other green tree tops for this card. 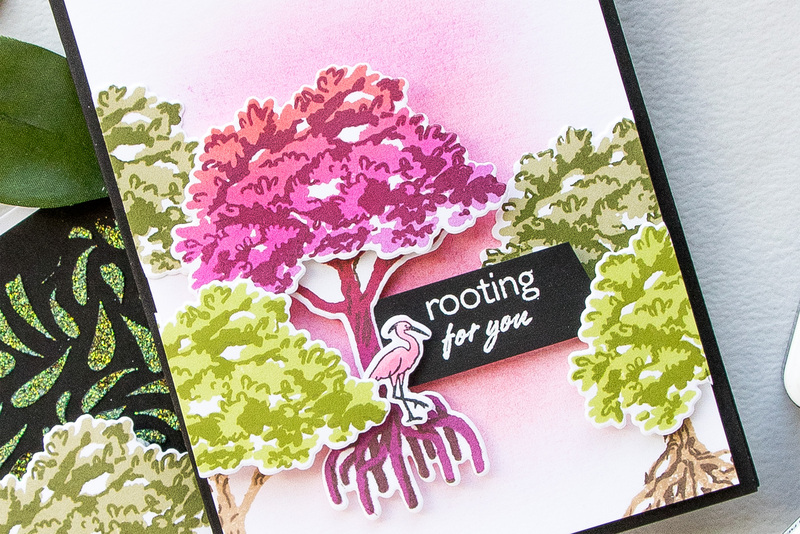 I heat embossed Rooting For You in white embossing powder onto black cardstock, this is how I did all of my sentiments today. Since I had two more treetops here I went ahead and stamped two additional tree trunks, but directly onto the panel this time. Once my stamping was finished I used foam adhesive and foam mounted all of these elements in place. After I foam mounted the two additional treetops I trimmed them as I didn’t want them going outside the panel and by the way I trimmed this panel to 4 x 5 1/4″; I used the leftover pieces to add even more greenery to this card and made it look like a forest. Later I foam mounted this panel onto an A2 black card base and I added a white cardstock panel on the inside to write a greeting. For my next background I used black cardstock along with Hero Arts Rain Dance stencil and glimmer paste. 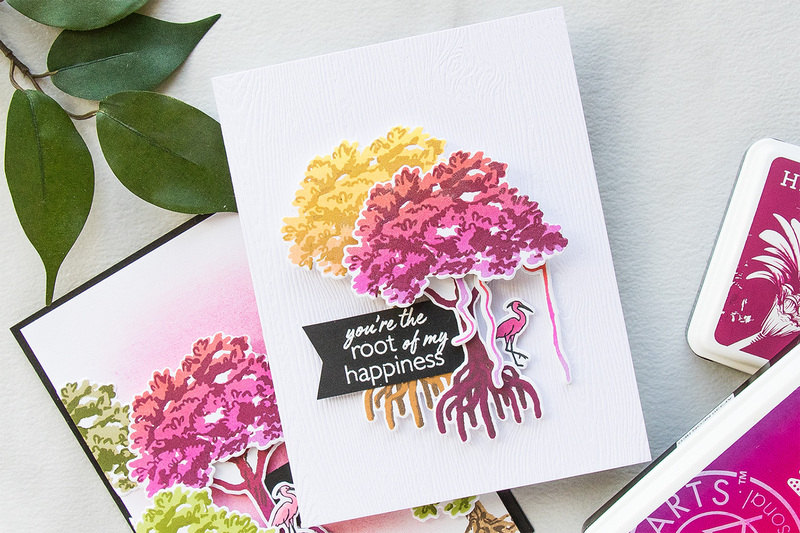 For this card I didn’t want to have a mangrove tree, but rather a regular tree. So I took my scissors and simply cut the roots portion of this image off and the minute I did it this tree trunk looked like it was designed like that and I couldn’t tell it had anything else to it. I foam mounted my regular tree along with a sentiment strip onto my background. For the sentiment I went with one that reads You’ve Grown on Me. 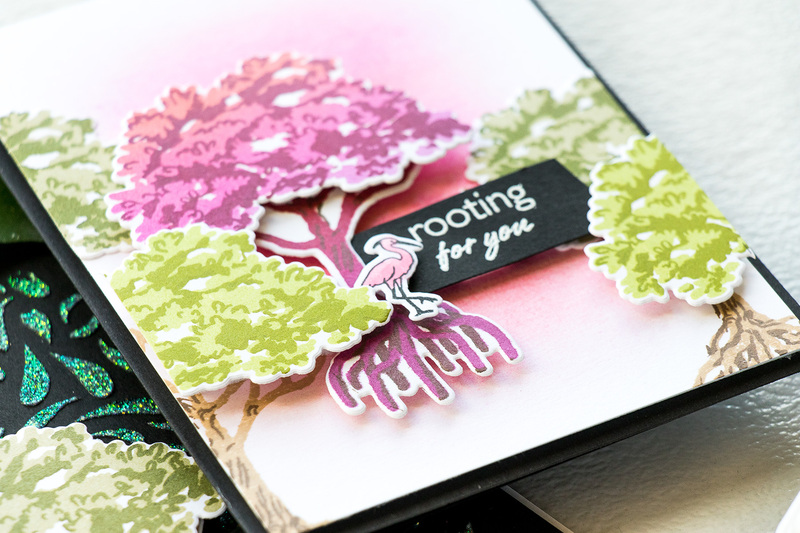 To finish this card I foam mounted this panel onto an A2 white card base. My last card for today features both of my neon stamped trees. 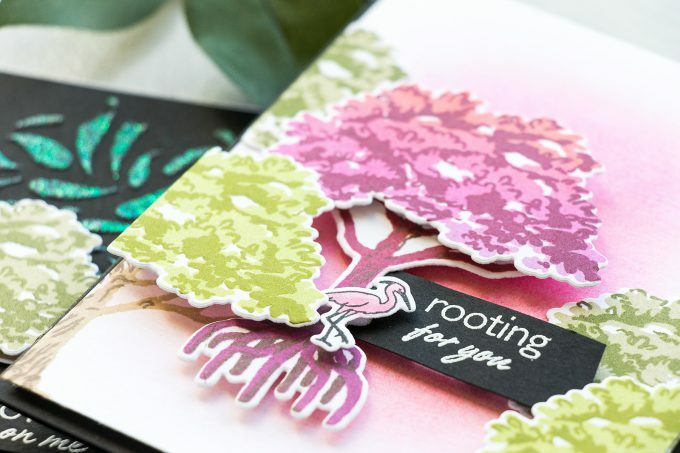 I foam mounted them onto a white woodgrain card base made using Hero Arts wood grain paper – I love using this paper for my clean and simple cards. I used double layer of fun foam for the tree top for my yellow tree to elevate it above the tree trunk and than triple layer of foam adhesive for the red tree top to elevate it even more. For this card I went with You’re The Root Of My Happiness sentiment, I also added a pink flamingo and I made sure to add some air roots coming out from the tree. This Color Layering Mangrove stamp set has several little images to complement the mangrove image one of them being the air roots and there’s actually 4 different roots to choose from. I used just 3 here. 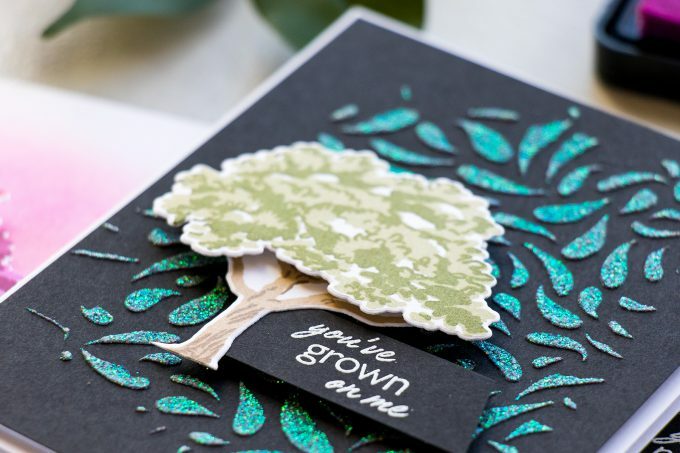 Other images are circles in the water – you can stamp those next to the roots of the tree trunk to make it look like as if they are going into the water and also there’s an image of a fish if you’d like to add that to your water. So lots of fun things to play with. Have you used this stamp set? Do you have a favorite combo for it? Share below! Have fun stamping! Dear Yana, can you tell me if you need to have more than one Tonic dual brush or several for each color used and how would you clean these brushes. Getting older and arthritic hands the brushes are a good option. I’ve seen the Mangrove tree stamp but passed on it. 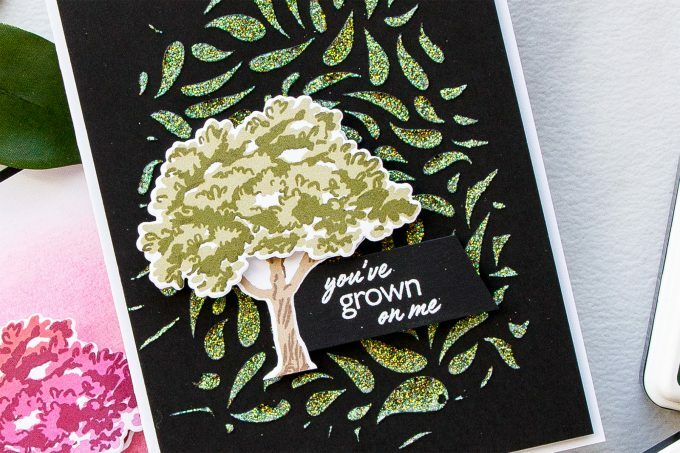 But now that I’ve seen you use is for these beautiful cards, it’s on my wish list. Thanks for the great video on the uses of this set. Ohhh! These cards are soo pretty!